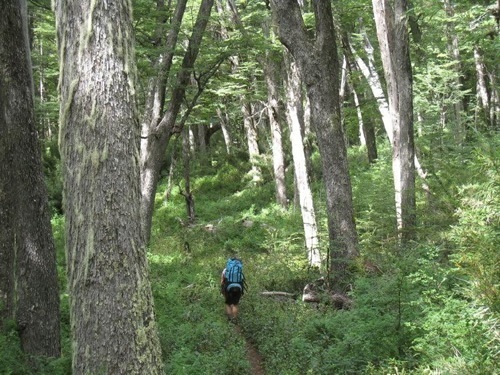 Hiking treks through the woods is one relaxing way to see the flourishing forests of the Patagonian Andes. The frosted mug and homemade beer had to be a dream. I was six hours into the dense, flourishing forests of the Patagonian Andes. A wandering, perfectly manicured single track trail had led me to a beautiful, rustic log cabin. It was my sanctuary, restaurant, and place of entertainment for a few nights, until I decided it was time to hike on to the next Andean refuge. Welcome to San Carlos de Bariloche, Argentina. The gateway city of Patagonia, and the jewel of the Lakes District, Bariloche is home to awe-inspiring outdoor adventure. From the impressive trail circuits created in the mid-1900s that flow through miles of untouched, virgin bamboo forests, glaciated mountains, and thick timberland, to parapenting the lofty winds with the immense Andean condor, this active city of 150,000 full-time residents takes your breath away. 1. Multi-day Hiking Treks: The intricate trail system surrounding Bariloche was created in the 1950s by Club Andino Bariloche, the mountain information service for the Lakes District of Patagonia. A hard working organization, the members created extensive single-tracks interlinking fully stocked and manned huts. Today, the treks can be broken up into day trips or long mountainous excursions. A popular 5-to-6 day journey takes you first to Refugio Frey, with the trailhead beginning at the winter sports Mecca, Cerro Catedral. There are two trails that lead to the hut, one from the upper mountain ridgeline, the other starting at the parking lot. Both take between 3-to-5 hours. Day two’s journey will involve a 5-to-6 hour walk, leading you to a rock and stone hut built by hand in 1957, Refugio Martin. Continuing on, day three offers the most challenging part of the circuit; 6-to-9 hours crossing over majestic rock spires that eventually spills you into the valley cradling Laguna Negra. The Refugio Italia, named after those inspired to build it, sits nestled against the small body of water. After resting, another 5-to-6 hour journey will bring you across rock pathways and thick forests to Refugio Lopez, a Pepto Bismo pink building that houses over 60 people in busy season. From here a wandering 3-hour trail with remarkable views of Lake Nahuel Huapi takes you back down to the main road, Circuito Chico. Of course, with so many huts in the region, there are various detours available, such as venturing towards the mighty Cerro Tronador from Laguna Negra. It is always best to check on trail conditions at Club Andino prior to setting off. Having a beer at a Refugio. 2. Canopy Tours: For those that enjoy flying through the forest, in addition to walking amongst the trees, a canopy is a great option for adventure. 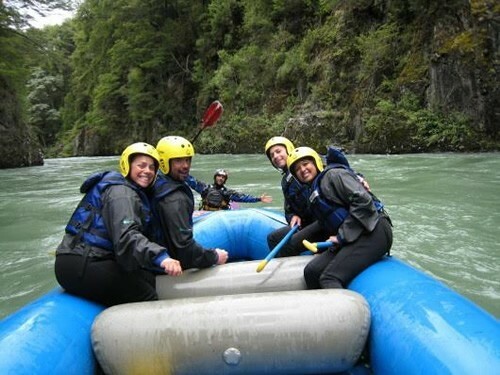 The most popular operation in Bariloche is the Canopy Adventure Tour. Located off the Circuito Chico, the owner has taken his own private land and made a great course among the tops of old growth Lenga trees. It boasts having one of the longest flight distances in the world, at 1.5 kilometers long. The company also offers winter service, allowing the experience of the beauty of soaring through a snowy landscape. In addition, they also offer full moon trips, offer free pizza, and local beer. The tour includes a drive up to the flight platforms via a picturesque 4×4 road. 3. Kitesurfing on Lago Nahuel Huapi: With Bariloche located in the Lakes District, there are many great options for water activities. One idea, perfect for the area due to the immensity of Lake Nahuel Huapi and the hefty winds that are known to blow from time to time, is kitesurfing. A relatively new sport to the Bariloche area, a recommended company offering lessons with certified instructors and wetsuit rentals is Kitebeach Bariloche. For the educated kitesurfer, there is an organized group of locals who take full advantage of the water and wind combination at Kitesurf Bariloche. 4. River Rafting and Kayaking: The rivers of the Lakes District are just as impressive as their emerald green lake counterparts. There are two main arroyos that offer excitement around Bariloche, the Rio Limay and Rio Manso, though Rio Manso has both an upper and lower section. There are multiple companies that offer varying difficulties of trips down the turquoise watercourses outlined by lush forests. One fantastic trip that includes some authentic culture is the Rio Manso into Chile excursion. Starting the paddle in the dense old growth Patagonian forest, the adventure finishes on the border of Argentina and Chile. Bonus: an extra stamp in the passport. The majority of companies also offer an authentic asado (Argentine-style BBQ) at a Patagonian ranch, otherwise known as an estancia. River rafting and kayaking are common on the Rio Monso. 5. Backcountry Skiing: Like their watery mirrors, the Andes Mountains surrounding the Lakes District are inspiring. 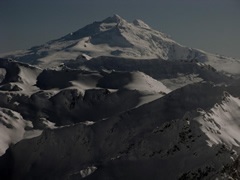 In addition to offering a broad amount of hiking choices in the summer, the wintertime brings a healthy list of backcountry ski descents. Beyond the volcanoes of Lanin and Tronador, there are various other mentionable downhill routes. 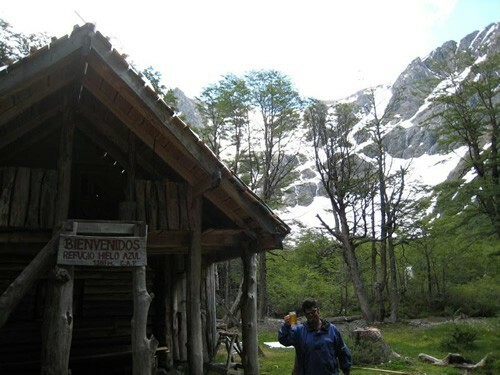 Probably the most popular off-piste hiking zone is Refugio Frey, the same hut mentioned earlier. Another noteworthy local is Refugio Neumeyer. A refuge accessed by a year-round dirt road, the area is also set up for cross-country skiers and sledding. But don’t let that deter you. Just beyond the area for the masses, the slopes become quiet and open up to different variations of skiing potential. Two other zones that can serve it up include Cerro Lopez, another area mentioned in the hiking section, as well as Cerro Ñireco. Cerro Ñireco is one of those mountains that calls to those that love skiing. Staring at you from the city center, the hill is north facing and a great spring corn run. Tronador volcanic mountain covered in snow. 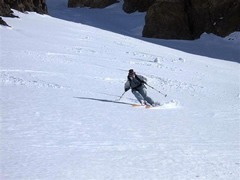 Backcountry skiing is possible in the Andes Mountains. 6. 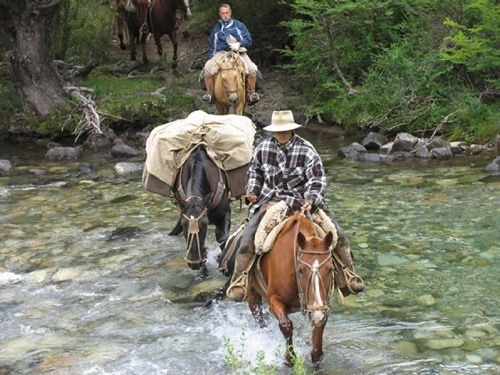 Horseback Tours: A true tradition of Patagonia—Argentina for that matter—is the gaucho (cowboy) lifestyle. The gaucho trade has a long, important relationship interlaced in the foundation of the country. Sharing a true gaucho experience is considered to be one of the best ways to enjoy authentic Argentine culture. All types of rides are offered, from just a few hours of riding to ten-day excursions. If learning about historic Patagonia is something of interest, then participating in a guided horseback trip with Carol Jones is going to be an unforgettable experience—knowledge of the area is in her blood. She is the granddaughter of U.S.-born Patagonian founding father, Jarred Jones. A character that ran with the likes of Butch Cassidy and the Sundance Kid, Grandpa Jones was the beginning of generations of familial bonding with the Patagonian Steppe. Horseback riding gaucho style with Carol Jones. 8. Mountain Biking: As one of those sports that matches well with great trails, there is stellar mountain biking around Bariloche. And to make matters even better, there are multiple shops in town that rent decent bikes and helmets (full suspension included). The single tracks tend to be tacky dirt that lends well to tire adhesion, with some paths accessorized with banked corners and small jumps. 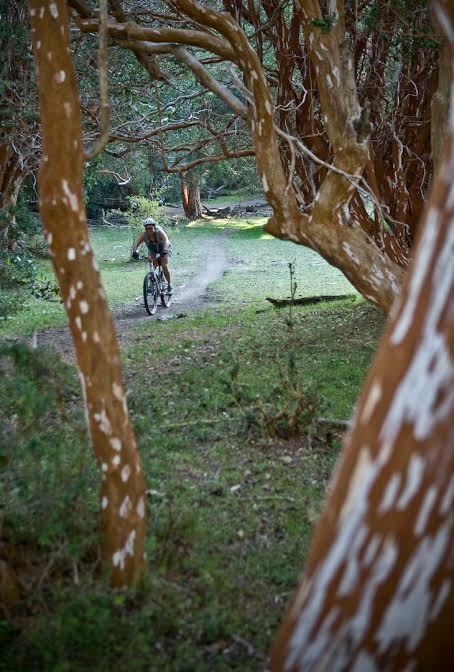 A few trails that must be mentioned include the cross country zone of Cerro Otto located in town, the access trail from Cerro Catedral to Lago Gutierrez, and the half-day ride located in the neighboring village of Villa La Angostura, Quetrihué Peninsula to the Parque Nacional Los Arrayanes. 9. Rock Climbing: There is no shortage of excellent rock climbing opportunities around the Bariloche area. In fact, the spires surrounding Refugio Frey are world-renowned for their 100s of multi-pitch granite crack routes. Piedra Blancas, located half way up Cerro Otto offers sport routes, generally in the 5.7 to 5.10 range. Other Bariloche areas include Laguna Trebol and Cerro Ventana. To locate decent guide books, check with Club Andino downtown. It is safe to say that Bariloche has enough adventure excitement to quench the thirst of any outdoor thrill-seeker. In fact, if you ask around town, you will find many have chosen to move to the area just because of the intense fun factor. No matter what season it is, there is always some activity that is enticing one to go outside. And with such a diverse playground and many local operators providing support, it’s hard to say no.